Audi thinks small is the next big thing. The German carmaker says its 2015 A3 and S3 sedans may be small in size, but they still feature the same luxury and technological amenities of the larger four-ringed rides. Audi unveiled the pair at a special event prior to the New York Auto Show. Looking at the A3, it’s easy to see what Audi is getting at. At 175.5 inches in length, it’s about 10 inches shorter than an A4, and 6.6 inches longer than the current A3. However, the A3 looks like a shrunken A4, with the same elegant, tightly creased lines, shield grille, and LED lights as the larger models. Fans of current Audis will love it. 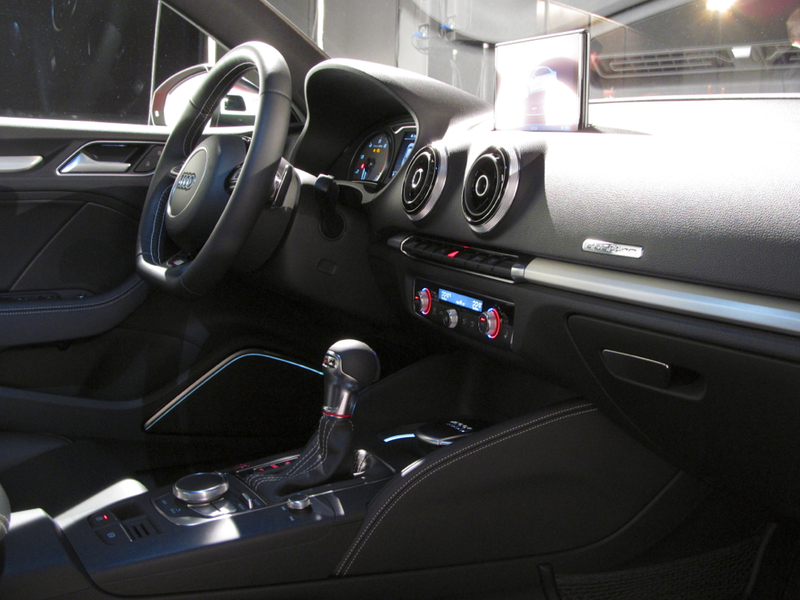 On the inside, Audi packed the 2015 A3 with tech, including a Bang & Olufsen sound system, 4G LTE connectivity, Nvidia Graphics Processing Unit, and the latest version of Audi’s MMI infotainment system. To make MMI more intuitive, Audi added a touch-sensitive button at the top of the rotary knob controller that allows drivers to quickly select what they want. The display is a 7-inch screen that electrically motors out of the top of the center stack. Google will also help A3 and S3 drivers get where they’re going with Google Earth 3D satellite imagery, POI search, and voice controlled Local Search. Audi didn’t skimp on interior materials either. The seats are trimmed in leather and there are plenty of high quality-feeling plastics. The sporty S3 also had some very nice bucket seats. However, not everyone will find Audi’s small sedan a nice place to be. The price of that attractive styling is a cramped interior. Anyone six feet tall or over will have trouble getting comfortable in the back, proving that while the A3 is a luxury car, it’s still a small one. At least Audi’s line of turbocharged engines will have less mass to haul around. The A3 will launch with a 1.8-liter TFSI turbocharged four-cylinder engine, producing 170 horsepower, and a 2.0-liter version with an unspecified amount of addtional power. After the base A3’s launch, a TDI diesel with a 2.0-liter turbocharged four will arrive, along with the S3, which will get a high-output version of the 2.0-liter gasoline engine. All engines will come with Audi’s S-tronic six-speed dual-clutch transmission. Audi will also bring back the A3 Sportback (hatchback) as a plug-in hybrid. It could be based on the A3 e-tron concept shown at the 2013 Geneva Motor Show. The A3 e-tron had a 1.4-liter gasoline engine and a 75-kilowatt electric motor that was integrated into the transmission. Total system output was 204 hp and 258 pound-feet of torque, and Audi said it would return 156 mpg on the European cycle. 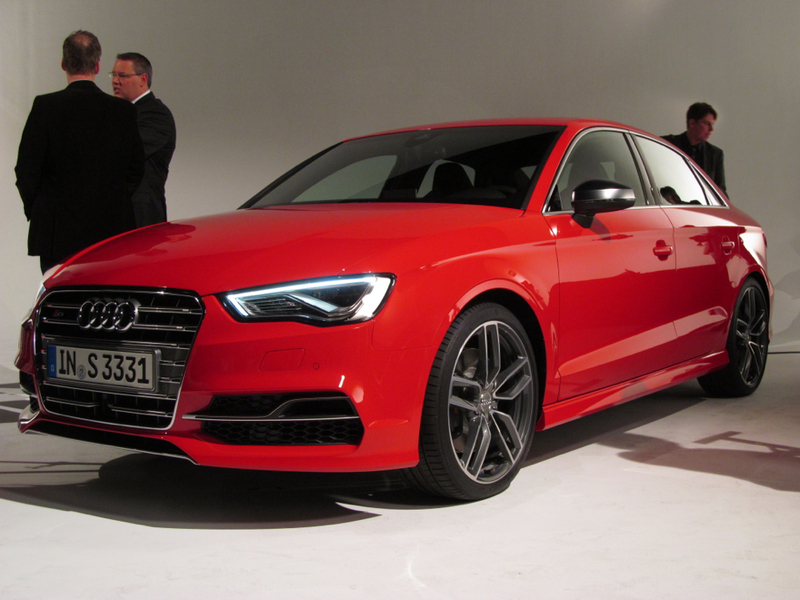 The A3 will go on sale in the United States next year, with the S3 and A3 Sportback plug-in to follow.